The story of Wyatt Earp, Doc Holliday, and the gunfight at the O.K. Corral in Tombstone, Arizona has been told in film so many times I have lost count. One of the early entries was Frontier Marshal (1939), and it has just been released to DVD as part of the 20th Century Fox Cinema Archives series. Randolph Scott stars as Wyatt Earp, with a young Cesar Romero as Doc Halliday. That is not a misprint, for some reason director Allan Dwan chose to change Doc’s name from Holliday to Halliday. Name change aside though, the character of Doc remains true to his legend. He is a master shot, a loyal friend to Earp, and very sick. The script for Frontier Marshal was adapted from Stuart N. Lake’s romanticized novel of the story, Wyatt Earp: Frontier Marshal. The influence of Lake’s account over the years reminds me of the classic line in The Man Who Shot Liberty Valence (1962) “When the legend becomes fact, print the legend.” In 1934, Producer Sol M. Wurtzel made the first version of Frontier Marshal. That film starred George O’Brien as “Michael Wyatt.” He went back to the well five years later with this Randolph Scott version. It would be seven more years before the “definitive” film of Lake’s book would appear though. That was John Ford’s classic My Darling Clementine (1946), starring Henry Fonda as Wyatt Earp. Interestingly enough, Ford chose to reshoot entire scenes from the 1939 Frontier Marshal. Another bit of trivia linking the three films is the fact that Ward Bond appeared (in different roles) in each one. It is probably unfair to compare Allan Dwan’s film to John Ford’s, but since they are both based on the same source material, it is hard not to. Ford’s use of Monument Valley as a backdrop is just one element that lends his film such power. He also had a pretty amazing cast. To be honest, Frontier Marshal plays out exactly as its place in cinema history suggests, as a second draft of what would become a Western classic. That is not by any means to say that the film does not have its own charms however. Although Randolph Scott is a little stiff as Earp, he brings a commanding presence to the role. And the choice of Cesar Romero as Doc Halliday is an interesting one. He has a polish that suits the character well. Before Tombstone (1993), all accounts of Wyatt Earp and company climaxed with the famous gunfight at the O.K. Corral. In this version of Frontier Marshal, the gunplay is fast and furious. Well, as fast and furious as was allowed in 1939 at least. Besides Scott and Romero, the film features fine performances from John Carradine as Ben Carter and Nancy Kelly as Sarah Allan. The usually stoic Ward Bond’s appearance as the cowardly town marshal is definitely against type and is also well played. 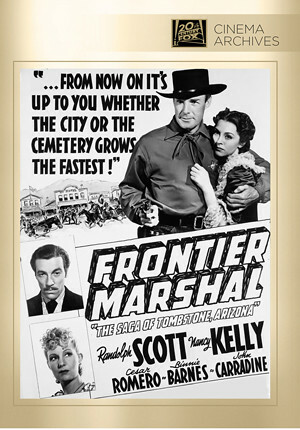 Frontier Marshal may not be an all-time classic Western, but it is a very good telling of the legendary tale. It is nice to see it finally available on DVD for fans of the genre.